The official photographs from Prince Harry and Meghan Markle's wedding have been released. The photographs were taken by renowned fashion and portrait photographer Alexi Lubomirski on Saturday afternoon at Windsor Castle. 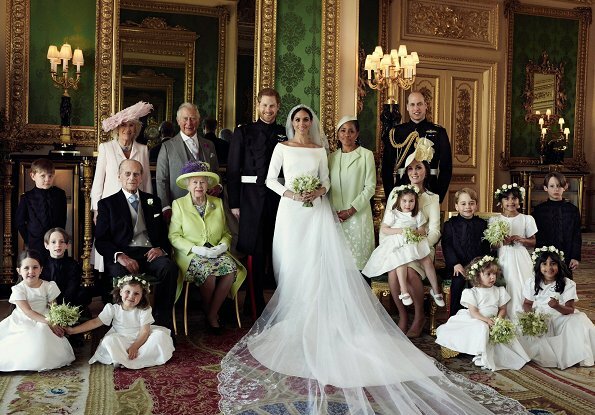 In one photograph, the newly-married couple are joined by Queen Elizabeth and Prince Philip, Prince Charles and Duchess Camilla, the Duke and Duchess of Cambridge and Meghan's mother, Doria Ragland. The group are surrounded by the page boys and bridesmaids. 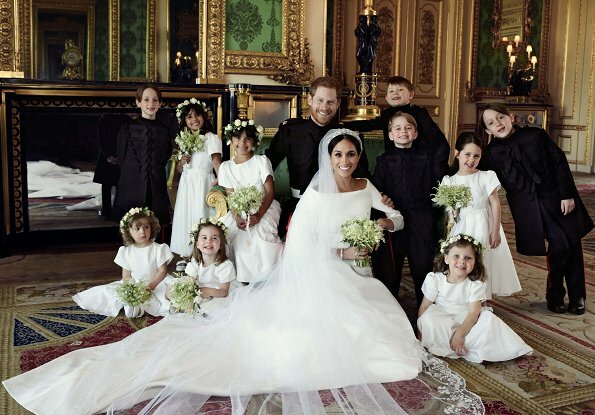 Another photograph, also taken in the Green Drawing Room at Windsor Castle, is a little less formal with the newly-married couple and just the children. "The Duke and Duchess of Sussex would like to thank everyone who took part in the celebrations of their Wedding," Kensington Palace announced Monday. "They feel so lucky to have been able to share their day with all those gathered in Windsor and those who watched on television across the UK, Commonwealth, and around the world." My sentiments exactly!! Harry's range of emotions is infectious. Stunningly beautiful and adorable. The children were fantastically well behaved for such a large group. The Spring colors of greens and pale yellow and white are lovely. Great pictures lovely and funny 😊, best ever. simply stunning! i love this couple and wish them only happiness. They don't have chairs in the Green Drawing room? What lovey photos, I especially like the one with the children. The newlyweds looks so happy and in love. It was a beautiful wedding and I personally loved her gown even though at first I expected more detailing but, with the veil, the whole thing was perfect. It was so good of William and Catherine to be seen on the bride's side as to balance out the picture and make Meghan's mother not feel or seem so alone. Stunning; absolutely love the pic with the little ones...I cannot help but smile back at them! Nice photos, very relaxed, very little apparent posing. I like that the bride doesn´t mind sitting on the floor or on the steps, very down-to-earth - literally. Unfortunately, Harry´s legs look a bit weird in the outdoor photo, as if he was wearing tights. Most importantly, they look genuinely happy. Isn't Meghans grandmother in her mother's side still alive? if so, why wasn't she at the wedding? These pictures are lovely. ...they would have eloped, I agree. They are mature. Catherine looks wonderful, and so does the queen. Doria Ragland really looks elegant and ladylike, her hairstyle is better than that of her daughter. In another magazine I saw pictures of Pippa and of Kitty Spencer, both look adorable. Kitty Spencer ist bezaubernd !! These are some of the nicest relaxed wedding photos I have ever seen. Beutifully photographed, light, color, composition. I especially love the picture with the kids. The flower girls are so sweet and the page boys in black the cutest. It is not easy to catch a photo with so many children. They all look happy and relaxed. 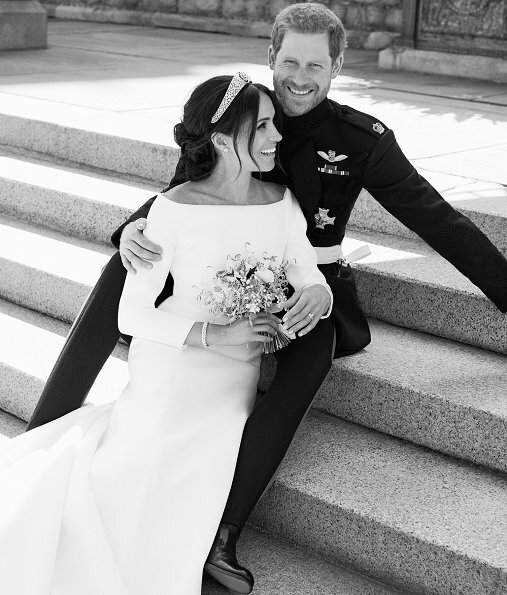 Love the black and white photo of Harry and Meghan on the stairs. I have a similar one from my own wedding. Sweet memories! Lovely photos. Love how the Queen's and Meghan's mother's outfits go with the spring bouquets and the pale greens. Lovely, relaxed contemporary style. She never had, not even during the ceremony. Instead she had the flowers attached to the ponytail at the back of her head. There is no such thing as 'posing' when it comes to kids between the ages of 2 and 7, lol. You just take what you can get and go with the flow, which is partly why these photos are so much fun and look so relaxed. This is most beautiful wedding I have ever seen anywhere in my 50+ years!! From the perfection of the bridal ensemble - to the intimacy of the father-in-law-to-be giving the bride away - to the beneficence of the couple's charitable endeavors - to the joy of them both... and I wish them every happiness!! Beautifully said @Unknown, there were some sweet and tender moments in this wedding, it was touching how Prince Charles welcomed his daughter in law into his family, how Harry searched the eye of Doria to calm her and reassure her, everything is alright, don't worry, we all will take care of your 'baby', how Charles was all Gentleman and lent Doria his arm when they left the chapel to sign the papers, how he had her near to him and Camilla on the stairs. These moments brought tears to my eyes, beautiful and touching. Totally agree with you Beth. Good thing we weren't watching together 'cause there probably would have been a flood with the tears. LOL! This is most beautiful wedding I have ever seen anywhere in my 50 years on earth!! From the perfection of the bridal ensemble - to the intimacy of the father-in-law-to-be giving the bride away - to the beneficence of the couple's charitable endeavors - to the joy of them both... and I wish them every happiness!! These are very nice Wedding pictures I love the B/W on the steps,all the children are on their best today what a memory for the when thy get older. The Queen even had a smile. I wish the couple all the BEST for their lives together. "The Duke and Duchess of Sussex are due to attend a Buckingham Palace garden party on Tuesday as part of the Prince of Wales's 70th birthday celebrations". Charles' birthday is in November, why so early celebrations? Just curious. The Royals rarely celebrate their birthdays on their actual birth date. A 70th birthday for the heir of the throne is a massive celebration, and no doubt the royal family will want to mark it on several occasions. On such a big occasion, the Royals will want to get the celebrations off to an early start. May is a much more fitting date to hold a garden party, than in November when the miserable weather commences. superbes photos! ils sont beaux très belle mariée. Magnifiques photos à l'image de ce qu'a été le mariage. À n'en pas douter, il y avait du bonheur et de la joie dans l'air. Je ne me souviens pas avoir vu de réceptions formelles aussi décontractées. Beautiful photos. The arrangement of the family makes it feel as if the royals are surrounding and protecting Meghan and her mother. The whole photos just oozes love. And kudos to the photographer for getting most of the kids to smile! Not an easy feat! My one (very small) complaint is that the lighting is slightly too dark. In the family photo you can’t see Camilla’s face well and the black uniforms blend in completely with the background. There should have been some balanced lighting to fight those shadows. Otherwise, great job! wat heb ik genoten, alles was zo mooi ,ze zagen er zo mooi uit !! bedankt voor de mooie foto,s!!!! Lovely couple. Gorgeous photos. I wish them both every happiness.